Studio 1 is our main room, with a separate control room connected via large glass windows. The live room itself was designed by world famous Eddie Veale and his daughter Eloise. The acoustics are stunning and facilitates many interesting combinations of live recording and tracking. We offer a rare bespoke control room set up offering 48 channels of SSL on the Duality console together with an array of other mic pres create a flexible and state of the art environment for recording and mixing. What sets us apart from everyone else is the selection of instruments and gear that you get to play with. From an incredible Bechstein grand and vintage guitars of all varieties, amps, basses and a 1970's Hammond C3 with original Leslie sitting in the live room to the mouth watering selection of compressors, EQs and monitoring options in the control room. Please browse the full equipment list! The layout of the rooms allows for eye contact between engineers and players, meaning that when recording different types of instruments simultaneously there is healthy separation and communication among the whole team. As far as we can trace back, we found that our premises were first used as a film studio in the 1950's. It later became 'Zodiac Studios' before Tony Visconti bought the lease and changed the name to 'Good Earth Studios' in 1976. Under this new guise, Tony recorded a plethora of great artists such as David Bowie, T-Rex, Thin Lizzy, U2, Moody Blues, Adam Ant, Prefab Sprout and The Alarm amongst many others. Other well known artists also hired the studio space independently during this time, including Paul Oakenfold, S'Express, The Smiths, Jesus and Mary Chain, Big Audio Dynamite, Frankie Goes To Hollywood, Tina Turner, Wham!, Duran Duran and Dexy's Midnight Runners. Tony sold the lease onto the music production company Joe & Co in 1989. They left Tony's original control room & studio unaltered but developed the rest of the basement into music recording/production suites. Robert Plant, Pink Floyd, Tim Finn, Brian Molko, Bruce Hornsby and Cliff Richard worked here during this period. Two notable sessions were with Charles Aznavour and Chrissie Hynde who each sang a duet with Frank Sinatra. Dusty Springfield also recorded her last ever track in Studio 1 in 1995. Lots of famous actors have read here such as Sir John Gielgud, Sir Ben Kingsley, Robert Stephens, Harry Enfield, Julian Clary and Pete Postlethwaite. Stephen Fry also recorded the audio books for the Harry Potter series. 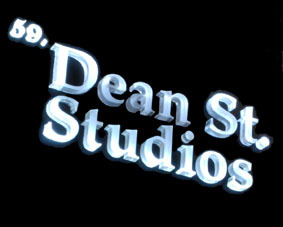 We launched Dean Street Studios in August 2007. Since then we have had the pleasure of recording artists such as Black Eyed Peas, Noel Gallager, John Legend, Florence + The Machine, Tinchy Stryder, Nadine Coyle, The Saturdays, Plan B, Marc Almond, Fun Lovin' Criminals, Sneaky Sound System, Carl Barat and Reverend and the Makers to name just a few. We have also hosted Disney, Sony, the BBC and the recent Orange Rock Corps project.